1. Pick up for this tour is at the Austin Convention Center 363 Trinity St Austin Tx 78701 (North West Corner). 2. The type of vehicle you will ride in is determined by your group size and availability. Groups of 2 or less will be Mercedes S550 sedan. Groups of 3-8 Lincoln Stretch Limousine. Groups of 9-14 Mercedes Sprinter Limousine. 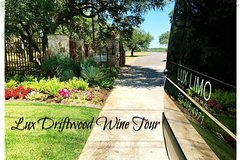 • Wimberley Valley Winery - Tasting Cost $ 12.00 - 5 wines or $18.00 - 5 wines and keep a souvenir glass. 4. Lunch will be at the famous Salt Lick BBQ in Driftwood Texas. You will be provided with a certificate for $15 to use at Lunch. While you may choose anything on the Salt Lick menu Lux Tours will only cover the first $15 of your meal. A Typical Lunch at salt lick for $15 would be be the Brisket Sandwich (very large) Coleslaw, Beans, Potato Salad. Pickles and Onions. * All vehicles will be limo style with the only exception being if the group size for the tour you purchased is less than 3 people.